On the strength of an all-new, 2.4L direct-injection 4 cyl.-engine and 6-speed transmission, GM expects a best-in-segment highway fuel economy of 30 mpg. WARREN, MI – General Motors Corp. will reveal the ’10 Chevrolet Equinox at next month’s North American International Auto Show, a compact cross/utility vehicle that will enter one of the industry’s few segments showing life. With year-to-date U.S. sales at a paltry 12.3 million units, marking the lowest January-November tally since 1992 according to Ward’s data, no segment has been immune to the economic downturn. But sales in the Middle CUV segment, where Ward’s places the Equinox and competitors such as the Toyota RAV4 and Honda CR-V, are off a relatively miniscule 0.9% through November. Only small and midsize cars have performed better. Experts say middle CUVs are benefitting from higher gasoline prices earlier this year, which drove buyers to downsize from large SUVs and pickups. And although the pain at the pump has eased recently, it stands to reason the middle CUV segment will enjoy growth in years ahead as gas prices climb again alongside economic improvement. “At a time when customers are so concerned about the fuel efficiency of their vehicle, the Equinox delivers,” Chevrolet General Manager Ed Peper says during a press preview of GM’s NAIAS unveilings here last week. On the strength of an all-new, 2.4L direct-injection 4 cyl.-engine and 6-speed transmission, GM expects front-wheel-drive versions of the 5-passenger Equinox to deliver best-in-segment highway fuel economy of 30 mpg (7.8 L/100 km). Those numbers are 25% more efficient than the current-generation Equinox. The auto maker forecasts city fuel economy of 21 mpg (11.2 L/100 km). All-wheel drive lowers that rating to 20/27 mpg (11.8/8.7 L/100 km). GM says the combination produces 182 hp and 174 lb.-ft. (235 Nm) of torque. Two-thirds of Equinox buyers are expected to choose the 4 cyl. engine, with the remainder opting for the 3.0L direct-injection V-6, which also is new for ’10. Both engines drink regular unleaded gasoline. Mated to a 6-speed transmission with manual shift control, the DI V-6 helps deliver fuel economy of 18/25 mpg (13.1/9.4 L/100 km) on FWD models. AWD trims V-6 fuel economy to 17/24 mpg (13.8/9.8 L/100 km). The combination delivers a peak 225 hp and 214 lb.-ft. (290 Nm) of torque. 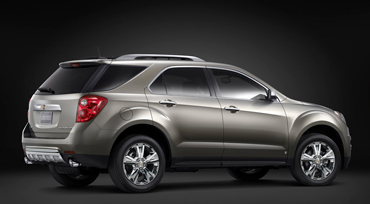 The new Equinox also draws greater fuel economy from a slippery exterior design. For example, GM moved the base of CUV’s fast windshield forward about 3 ins. (7.6 cm) and shaved its tail lamps to the perfect angle so wind slips off cleanly. The redesigned Equinox, which will fall between the HHR and newly launched Traverse to round out Chevy’s CUV portfolio, rides on the same revamped Theta II platform shouldering the Saturn Vue and upcoming GMC Terrain. Although it retains the same 112.5-in. (285.8-cm) wheelbase as its predecessor, the new Equinox arrives 1 in. (2.5 cm) shorter and 1 in. wider. It also carries more pronounced wheel arches to deliver a planted, aggressive stance and emphasize its off-road capability. Among other design changes, rocker panels on the new-generation Equinox were integrated into the door, allowing for easier ingress. Simcoe says the change answers complaints from owners dirtying their pant legs stepping into the current-generation model. Inside, the ’10 Equinox boasts buckets full of storage space, including a well under the center armrest large enough for a laptop computer case or oversized woman’s handbag. Ice-blue ambient lighting provides an upscale appearance. In the rear, Equinox adds a rear-system capable of moving fore or aft 8 ins. (20.3 cm) to provide what GM expects will be segment leading legroom. With the rear seat pulled forward, the cargo area provides 31.4 cubic-ft. (889 L) of space. In a particularly thoughtful piece of engineering, GM adds an adjustable power liftgate that can be programmed so it doesn’t strike the roof of smaller garages. “We thought of everything,” says Tim Herrick, Equinox’s chief engineer. The CUV rides on a 4-wheel independent suspension and uses a rack-mounted electronic power-steering system that extends the range of 4-cyl. models by about 11 miles (18 km). “Equinox delivers all the comfort of a sedan with the functionality of an SUV,” Peper says, adding the vehicle targets small families with an eye towards practicality. It arrives at Chevy dealers in mid-2009 from the CUV’s current manufacturing location in Ingersoll, ON, Canada. Pricing has not been determined, although the current model starts at $25,010, including destination.